Fun and feminine, this distinctive bedroom curtain adds a playful touch to any space. 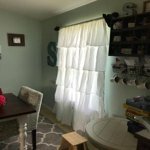 Featuring five layers of cascading ruffles, these unique window curtains provide extra privacy and have an eye-catching look that really stands out. Made from 100-percent polyester, these modern curtains are durable and designed to maintain their color without fading from the sun. Available in sizes 63-inches,84-inches and 95-inches by 42-inches , these window curtains will fit most windows, and installation is as simple as putting your curtain rod through the pre-cut holes at the top hem. Panels are sold as individuals so you can make sure you’re getting exactly what you need to cover your small or large windows. A low-maintenance option, this gorgeous curtain is machine washable. Simply put it in cold water on a gentle cycle and tumble dry on low when needed to keep it looking fresh for years to come. These curtains are super cute!!! 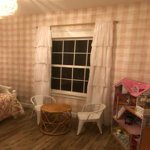 Go perfect with my farmhouse theme in my room. Covering sliding glass door im room, lets just enough light in. They fit my 1 1/2 inch wooden rods, they block light very well, they look amazing! I love these curtains. I bought 3 panels to cover a double window. They hang very well and are beautiful. They lighten up my room. I have no complaints at all. They are surprisingly nice quality, especially for the price. and the color is nice not yellowy like most. I ordered the purple shade for my little girl's bedroom. They look just as pictured. Two of these fit one window very well. You will need to iron or steam these prior to hanging them. I used a basic metal rod but, would suggest another type to prevent snagging. A few loose threads but, was a quick fix with scissors. ALSO, these filter out light very well. I was actually surprised by that. My daughter loves these. Yes, I do recommend them and I am purchasing another couple of these in white! Please keep in mind that there is only one panel included. Theyâre cute in my daughterâs room. However i ordered Coral and according to the packaging it is in fact coral, yet it really does look like blush they offer. Overall they are still nice curtains. these are cute but when the light shines through they have sort of a blue cast. If all of the bedding wasn't stark white it would have probably matched better. I just put them on the outer corners of the window with sheers in the middle to solve the problem. Please read everything from this item... its only one curtain in the package and material feels cheap. 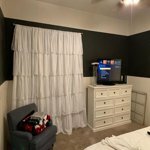 Is this a pair of curtains or just one panel? 1. The price is for one curtain. Does this have 2 panels ? 1. The package comes with 1 panel.